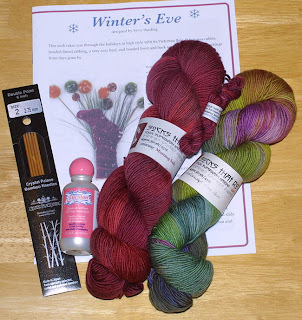 Sittin 'n Knittin: Thank You, Secret Pal!! I got my Secret Pal 9 package Saturday, but just had a chance to photograph it: She gave me her final 2006 Rockin' Sock club package!! TWO skeins of STR lightweight, colorways Mustang Sally and Rare Gem, emergency sock yarn keychain and the Winter's Eve beaded sock pattern. Plus some Crystal Palace DPN's and a little bottle of Eucalan. I've never really had the desire to knit with beads, but this pattern and the Mustang Sally may just be the inspiration to do it. Thank you Tiffany! I will be sending off a package to my Secret Pal tomorrow morning, photos once she gets it!